This is another variation of the famous empanada. A savory cheesy beef empanada made from cheeseburger patties and grated cheese. 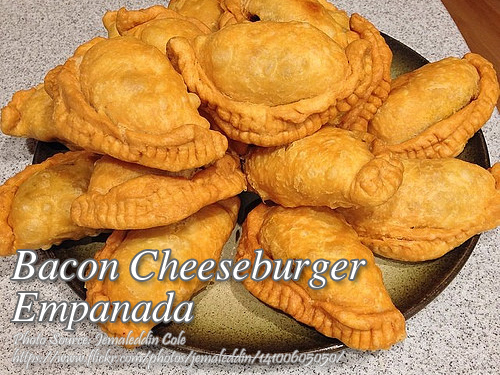 Unlike the usual empanada that you have to prepare the meat along with filling and then pre-cook them, on this cheeseburger empanada, you have to make burger patties first and grill them. Then crumble them again and mix with the rest of the filling ingredients. And then fill the dough with the filling mixture and fry them. There are also other option of cooking this empanada other than deep frying. You can also bake them if you prefer a less greasy empanada but you need to brush it with eggwash. Place the ground beef and onion in a large bowl. Season with salt and pepper. Mix until evenly combined. Divide the mixture into 6 equal parts. Shape each portions into burger patties. Chill the patties. Preheat the grill to high and brush it with vegetable oil. Grill the patties until cooked for 4 to 5 minutes. Place the burger patties in a bowl and let it cool. Crumble the patties using your fingers and mix the grated cheese and bacon. Set aside for use in filling the empanadas. Combine flour, sugar, salt and mix thoroughly. Mash the cold butter into the flour mixture. Slowly mix in the ice water into the mixture to make a dough. Color the dough with achuete oil by continuously kneading the dough and slowly adding the oil. Place the dough in a bowl, cover with plastic wrap and let rest for about 30 minutes to an hour. Dust a clean table with flour so that the dough will not stick to the table. Flatten the dough with a rolling pin and roll until ¼ inch thick. Using a round cookie cutter, cut the flattened empanada dough into circles about 3 inches in diameter. Dust a baking pan with flour and place the shaped empanada dough, cover and set aside. To assemble the empanadas, stuff each empanada dough wrapper with 2 tablespoons of the filling at the center. Dampen the edges of the dough wrapper with beaten egg. Fold the dough over to form a semicircle. Pinch out the corner of the dough, and fold it onto itself. Pinch and pull out another ½ inch section then fold it over so that it slightly overlaps the first one. Repeat along the length of the folded side until you form a twisted seal. Preheat deep fryer to 175°C. Deep fry the empanadas for 6 to 7 minutes or until golden brown. Transfer to paper towels to absorb excess oil. Serve with catsup and mustard.